I noticed that a well-known art supply store “appropriated” some original content from this site, both graphics and text (see screen grab below, click to enlarge), to help sell their CalCedar products. While the Copland photograph is from the A.P., the one they used was taken from this site. The picture of the vintage Blackwings is certainly mine (original here), and so is the underlined text (original here). The remaining text borrows from some other sites too, yet there isn’t a single attribution—and on a commercial site no less. I think it’s fair to say that this isn’t due just to some careless online image search; it’s overt theft. You can see this sort of thing happening between blogs here and there, but it’s disappointing when such an established company—one presumably devoted to art and the work of artists—cares so little about copyright. The problem with stealing from a site like this one—whose content is so particular (and is so infrequently visited)—is that it’s easier to get caught. 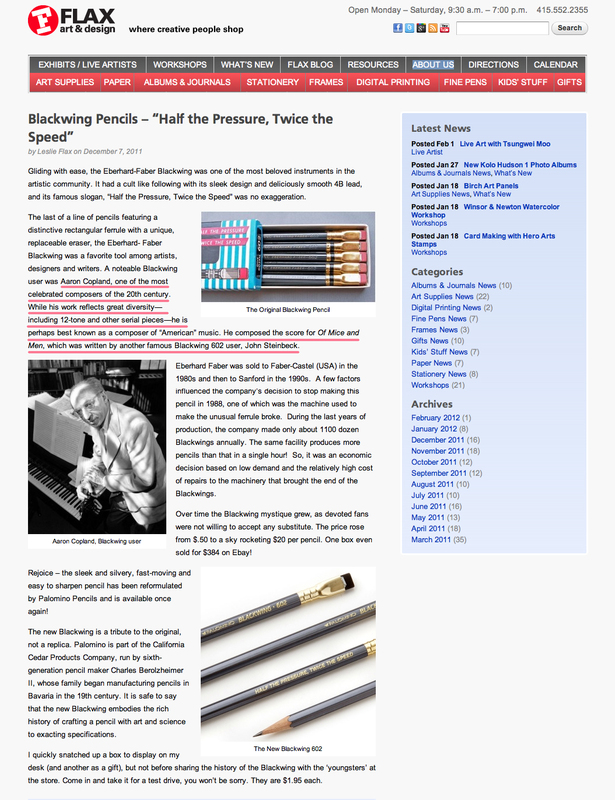 I couldn’t help noticing that while the page for Blackwing pencils was completely re-written, the same author chose to plagiarize again! Even if once is a “mistake”, twice is a pattern. Sad to see that copyright isn’t respected. Not what one should expect from comapnies’ PR departments. Maybe it stems from the idea, that all information should be free on the www? The European Council is debating this at the moment and is expected to promote a bill which should at least limit these ”misuses”. The ACTA which bannes the infringment of copyright for commercial uses. Have you considered a lawsuit? Yes, I was using FLAK (Fliegerabwehrkanone) as a pun on the company name, as well as the sentiment of my post. There’s really nothing to prevent this sort of thing from happening, except for honesty and integrity I think. I’m sure some might think this isn’t a big deal, and it isn’t if they’re measuring in dollars and cents. But it is a big deal to plagiarize and assume authorship, and they should have known better. What a shame. Have you tried to contact them? Leslie Flax’s appropriation of your work seems especially nervy — both your words and your photography. Shame on her. I wonder what she would think if you chose to appropriate some writing instruments from the Flax store. I wonder too what else on the Flax site has been appropriated. Sorry to hear you’ve been nicked again. I have to admit that I sometime use images not taken by myself for blog posts, but I assume they are “fair use” in that case, something probably not the case with Flax and your blog. My main objection is that the content was used on a commercial site. It’s a little easier to understand when someone with a small, personal blog might grab a photo after doing an image search, then post it on their site without attribution. I’ve found some of my photos on other blogs. But in this case it was a business, who wanted to prop-up their product with some of its history, and didn’t have even a twinge of discomfort copying photos and text from somewhere else. And it’s not as if they got it from Wikipedia, or that this specific content is widely available. As far as I know, this is the only place that has as much to say about genuine Blackwings and composers, in the manner it does. I realize we’re not talking about the plagiarizing of great literature here or something, it’s just the thought of it all. It’s not so much shocking as it is disappointing; it was artists (or at least, those involved with art) who felt this was O.K. to do, whatever their reason.